Gap really did not want me to forget that this was their "Give and Get" promotional weekend. They emailed me four times. And 30% off everything (even sale items!) is a good deal from the Gap. Usually they can be a touch stingy with their discount coupons. Often if the coupon is for 25% off, it's only good for 15% off a sale item. I decided I might as well take advantage of their generous offer and get those basic long sleeve tees I've been wishing for, but reluctant to buy. Honestly, it was like pulling teeth (I hate buying basics!) I got black, white, and red v-necks and a dark grey scoop neck. They ranged from $10-$15 pre discount, and totaled $37 after the discount. Since you needed to spend $50 to get free shipping (and you know how I need my free shipping) I also decided to get this cowl neck sweater in taupe, which ended up being $27.65. Other fun activities of the weekend included lunch at this cute little restaurant called Ballou's, where I enjoyed a grilled chicken panini and chocolate fondue! Other delicious things included macaroni and cheese, wine cocktails, and huge mocha lattés. I really wanted to buy the sequin skirt and Pierre Hardy booties at Gap with the 30% coupon, but since I'm on a shopping ban, I resisted. Looks like you got some good deals! 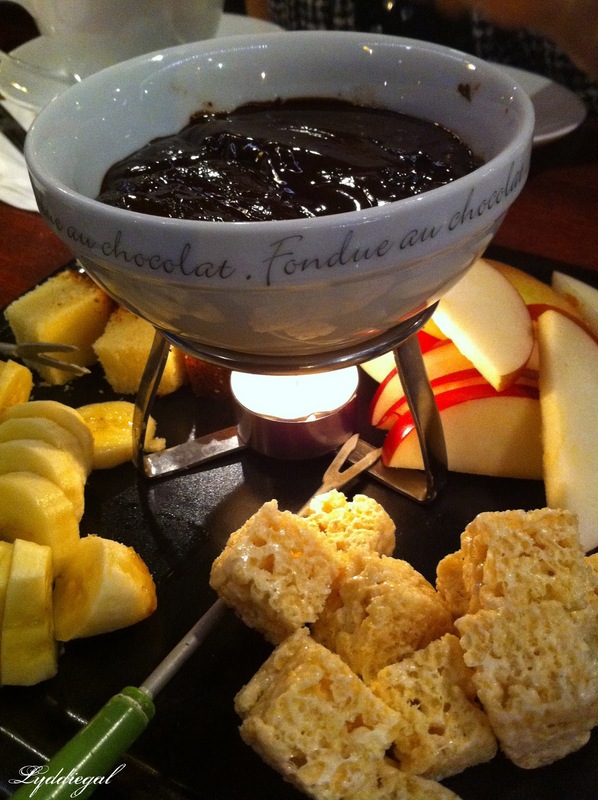 I love the tights you are wearing and that fondue looks divine! wow stunning! that's an amazing bag! That bag caught my eye. So perfect with the blazer and is surely a keeper? Sounds like you got some good deals at the Gap!!! Basics are always a pain to buy but I end up wearing them the most!!! Love your outfit above!! Tights are such a fun fall accessory! oh my gosh you got some AWESOME deals at Gap!! I should jump on it and see if any of the cords are left!! ps-that gold ring is really pretty. Such a great outfit! I love those tights! I love that cowl neck sweater! I feel like it's such a flattering neckline! It will be nice to see how you style it! I have to have my free shipping too. If I am going to be spending nearly 50 after paying for shipping I might as well GET something and pay the 50 with free shipping. Of course, you don't need convincing. And that fondue??? Looks amazing!!! 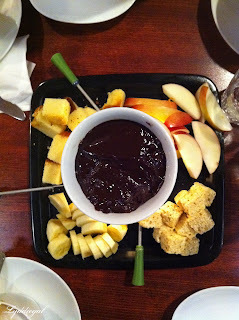 That fondue is making me want to go get a snack, it looks amazing! And those tights in your outfit pic are so cute! I'm always really reluctant to buy basics too! I usually only do it when I'm going to get a bargain like you've done. 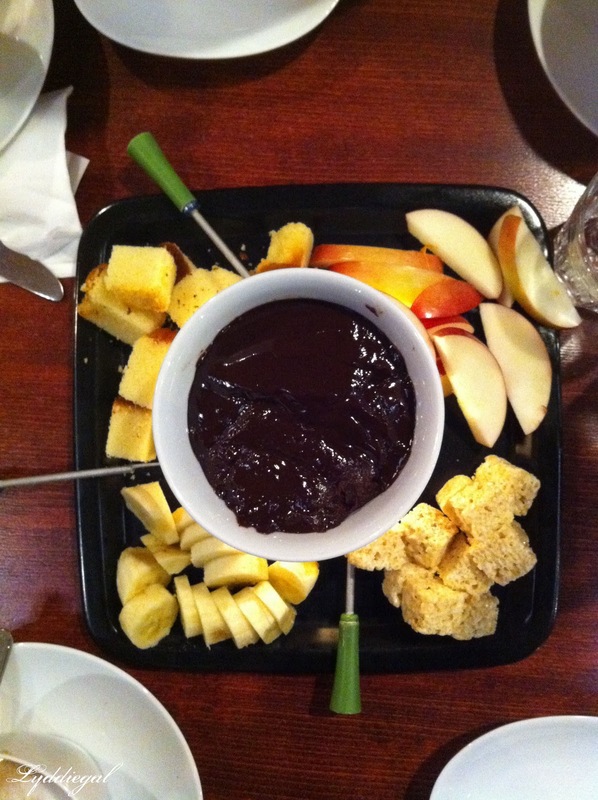 Ooooh yum and I love chocolate fondue. Or cheese fondue. mm.. anything dairy like and creamy! haha. I kept getting tempted by those Gap emails too. Like save money AND help a charity - it almost felt wrong to not buy anything! I can't wait to see how that sweater works out for you. I tried it on in green in the store and it was super cute, but too short for me, so I had to take a pass on it. It's a shame, because it's soooo soft and otherwise pretty comfy. I really like the little details of this outfit, namely those tights and that gorgeous ring! 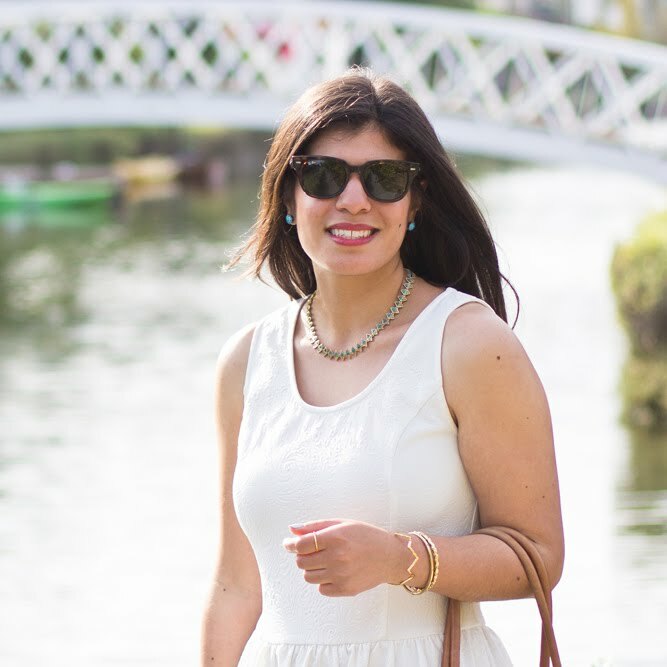 Adore your outfit! Especially that ring. 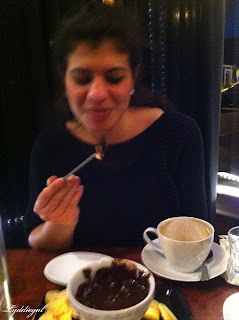 And that chocolate fondue looks so yummy! I will have to go and have a look at the GAP website now! Love the sweater. I'm with you - buying basics can be so painful! It's so much more fun to spend the money on something that feels more special. It sounds like you made really good choices, though (and basics are necessary...). I hate buying basics too, its so boring but needed I supposed. 3. I hate buying basics, too. UGH it's the worst. I feel like I'm wasting my money. Isn't it just terrible? I do love your outfit, though-- the pop of yellow is just so pretty, and and and gold against black is always so royal and elegant, Queen Lyddie. 4. Your leaves are still lots prettier than mine. I envy this. And that fondue looks soo good. the Italian tights are beautiful! CLEVER BUYS!!! VERY PRETTY OUTFIT TOO!!! gorgeous outfit and that fondu looks like so much fun and amazing! I'm on vaycay and totally flaked on staking advantage of their sale. DARN it. And I really want their denim leggings. Maybe they'll have another one? CSN Stores $65 Gift Certificate Giveaway!